Rodenticides : these are expensive and may harm species of mammal predators and birds of prey which help to prevent pest outbreaks by preying on rodents. Integrated Pest Management by the introduction of Barn Owls (Tyto alba) : the efficacy of Barn Owls in controlling rodent populations varies between different oil palm landscapes. This research aims to better understand how predation by small mammals (eg. civets, wild cats, mongooses) complements predation by barn owls in order to provide more effective natural pest control in oil palm plantations. This research will assess variation in the diet of both small mammals and barn owls within and between several oil palm concessions. 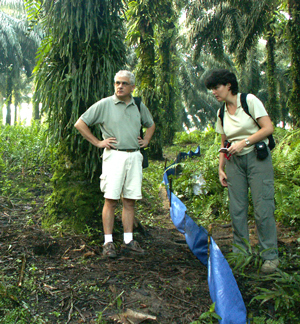 It will also gather information about where these small mammals are found within the oil palm concession, which will provide an insight into how populations of small mammals that help to control oil palm pests can be maintained and enhanced within the oil palm landscape. This research is carried out on several PT SMART oil palm plantations in Sumatra and Bangka, Indonesia, in the framework of a research program leaded by CIRAD (France), SMARTRI (PT SMART research institute) with the support of the Chrono-environment department of the University of Franche-Comté/CNRS (France), in collaboration with LIPI (Indonesia) and CBGP (France).